Pete with one of his hero’s, the great Chubby Wise. 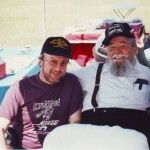 This photograph was taken in the 1990’s at the Kissimee Bluegrass festival, USA. It shows Pete with the great Chubby Wise who claimed authorship of the tune Orange Blossom Special. Author DCB'sPosted on January 2, 2017 January 14, 2017 Categories Video's2 Comments on Orange Blossom Special. Polka on the Banjo, a great song and so much fun to play. Joined by our good friend Mr. Dan Norton on Mandolin, this is our version of “Ashoken Farewell”. Mags Layton shared a Page to your timeline. DCB's on Acoustic Special, Loughborough. DCB's on Orange Blossom Special. dave fowkes on Orange Blossom Special.